After travelling New York to Florida on our East USA road trip, we were told several times that the Pacific North West was even prettier and we had to do it. Having never been camper vanning before we thought that would be a neat way to see all the natural beauty along the way. 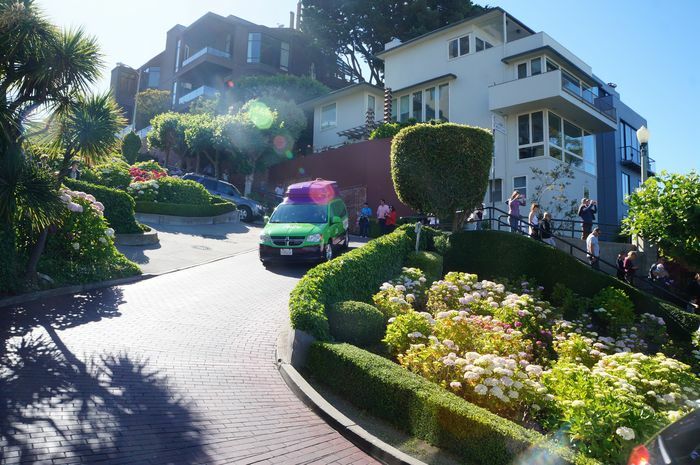 Jucy is a company well-known in New Zealand, and when we found out they also were located in San Francisco, we knew they would be the perfect solution. Their vehicles are not giant RV’s. Instead they had a minivan named Champ. Champ was a 7”4’ Dodge that seemed to include everything, including the kitchen sink. When you first see the car, you can never forget it. It has been the highlight of our trip across the West Coast as people frequently stopped to ask about it and see inside. 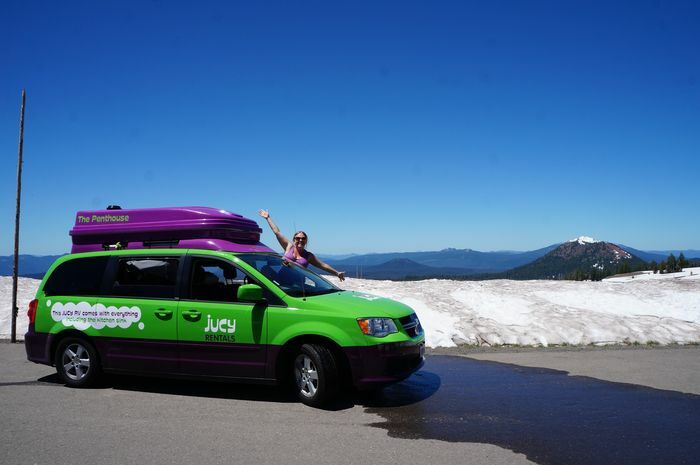 Clad in neon green and eye-popping purple, it’s hard to miss, especially with the Jucy logo on it and the Lucy cartoon mascot. We almost felt like rock stars on tour travelling around in this vehicle. 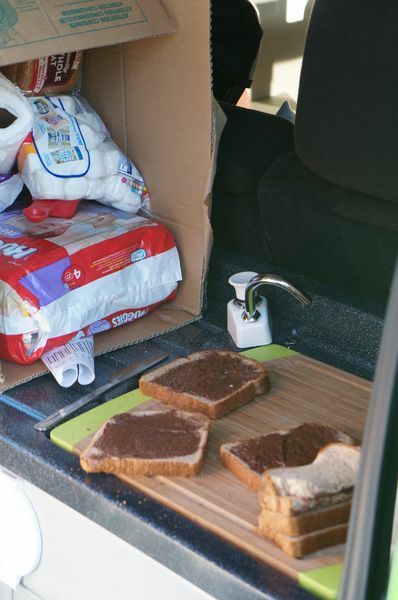 Let's start with the boot, it's got everything you need (accept a toilet). Inside the back is a kitchen sink, gas stove (plus spare), fridge drawer, cupboards with cookware, cutlery, plates, bowls and such. The fridge drawer was bigger than anticipated and fit our 2 litre milk plus yoghurts, canned fruit, water bottles, carrots, tomatoes and more. All in all, this Champ is one fine camper. 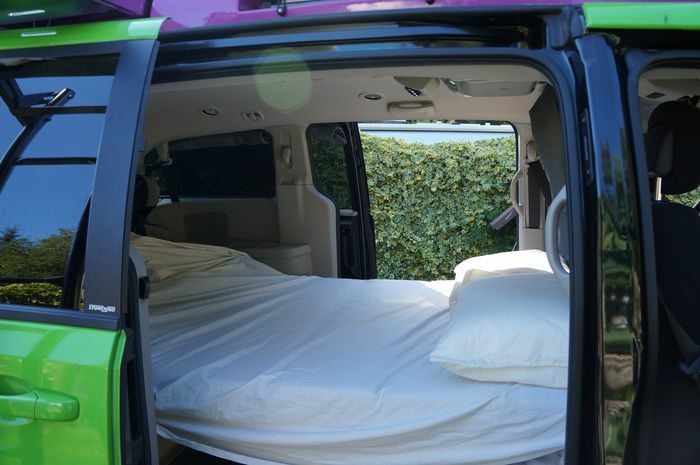 It gave us so much more flexibility then a massive RV as we can stop in at restaurants, supermarkets, delis and attractions with no worries about parking (except the height, most shorter drivethrus didn’t quite fit). I could drive it through cities like San Francisco and Seattle without any fear of hitting anything or anyone. And my favourite, it was pretty good on fuel. 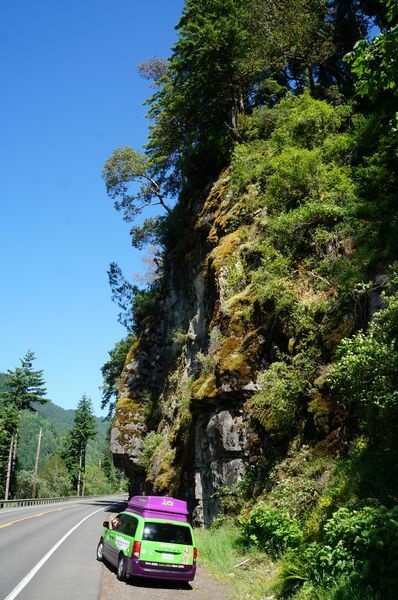 Check out where our Jucy Champ went in the photos below or read our Pacific North West Road Trip Posts! Yosemite, Crater Lake & it's snow, Avenue of the Giants, Camping, Crooked Street San Francisco, Yosemite. We've seen a few of these on our travels - good to know it works - great concept. It's like I could use this as an excuse to go to the Bay Area. Wonder what it would be like to go all around the Midwest with this thing. If only it would be available to get dropped off after a linear plan like San Fran to Denver or something. Anyway, it's still awesome. 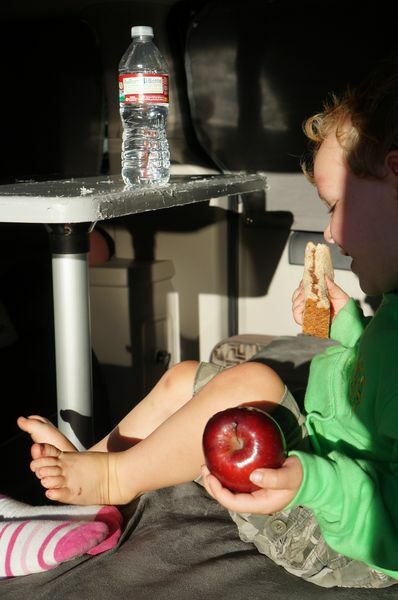 We hired a camper in NZ for 2 weeks and hated it. 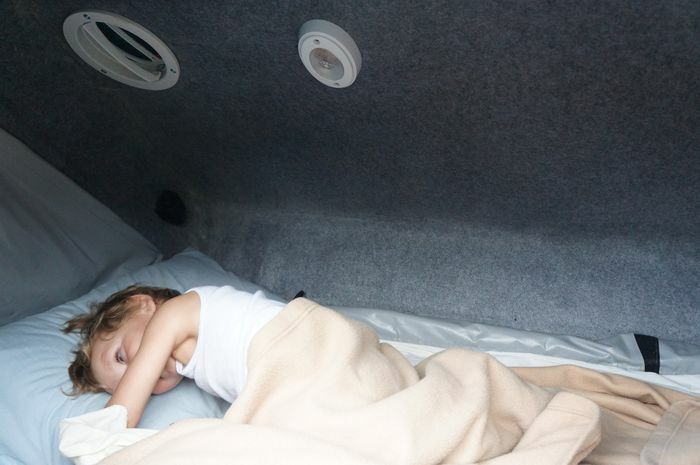 Love NZ just hated the 'Transit Van with a bed in the Back' as it came to be known. Too big for the windy roads and a fortune to fill with fuel. And so little space for such a big van. 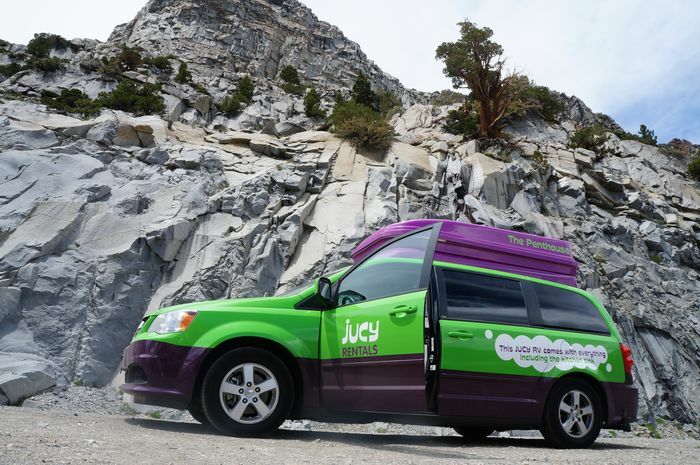 We got camper van envy when we saw the Jucy vans. If we ever geta camper again, it will be Jucy all the way. The campsites in NZ are so well equipped with excellent kitchens, super clean shower and toilet blocks, you only need a van like this. We have recently travelled around Tasmania and we were slightly tempted at the camper van option. However, it just seemed too much to drive around. This particular vehicle is compact enough to accommodate our family and looks practical to serve our purposes. Thank you for the photos and for sharing! We will definitely keep this in mind when we travel to NZ! 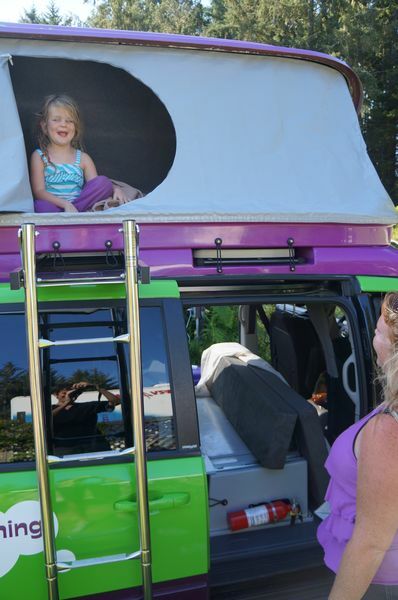 Nice, the Jucy campervan fit inside the Chandelier Tree? If so, that's awesome! You certainly can't do that with a big RV. 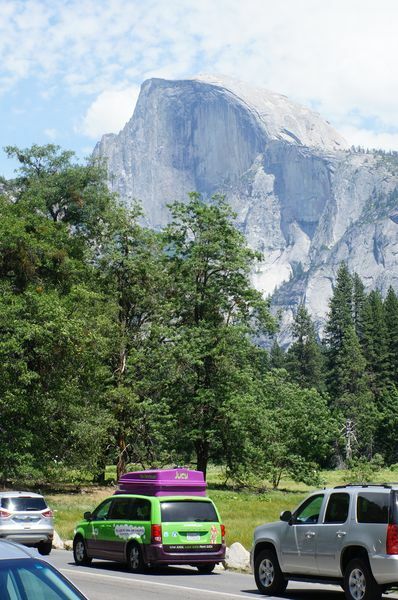 I appreciate your story and photos, I'm doing a Jucy roadtrip from the Bay Area up to Central Oregon next weekend and we have so many questions about what the van is like!